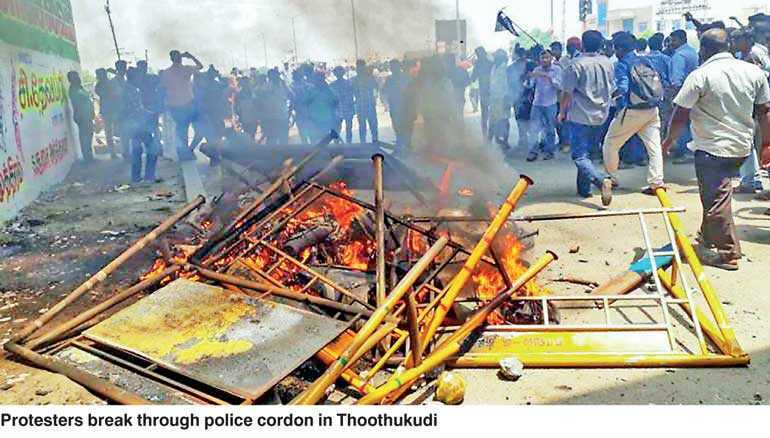 The 100-day agitation against a major copper smelting plant at Thoothukudi in Tamil Nadu, which led to 13 deaths in police firing earlier this week, has brought into the open the many-faceted dangers of ignoring environmental issues. The Thoothukudi agitation had matured to the extent that it had become a happy hunting ground of Tamil separatist forces, with possible links to similar forces in the Tamil diaspora and also other groups interested in destabilising India. The Sterlite copper smelting plant in Thoothukudi is part of the London-based group –Vedanta – owned by Anil Agarwal. Set up in 1993, it has been having trouble with locals on the issue of environmental pollution from day one. Over the years, protests against it had snowballed to such an extent that, today, they are led by Tamil separatists owning allegiance to the slain Sri Lankan Tamil Tiger leader Velupillai Prabhakaran. Separatist groups in Tamil Nadu, whose demonstrations on the issue have brazenly displayed banners with pictures of LTTE Prabhakaran, are portraying the Thoothukudi agitation as being against the “persecution of Tamils” by the Indian State, thus giving an environmental issue the colour of an emotive ethnic cause. One of the leaders of the Thoothukudi agitation is Thirumurugan Gandhi of the “May 17 Movement” which had been agitating for action against the Sri Lankan armed forces on charges of “war crimes”. Giving a boost to the agitation is a London-based anti-Sterlite organisation “Foil Vedanta” led by Samarendra Das. Das works in conjunction with the Thoothukudi-based agitator Fathima Babu. Das, who hails from Odisha in Eastern India, had visited Thoothukudi twice to liaise with Fathima Babu. While Fathima Babu’s organisation had acknowledged his first visit, the second had been kept a secret raising questions about the purpose of the visit. Newspaper reports do say that the Police suspect a “foreign hand” in the agitation. The Christian evangelical churches which get Western aid are also co-opted. Mohan C. Lazarus, who runs a television channel, is one of the leaders of the agitation. A fundamentalist Christian evangelist with political clout, he is said to be a Dravidian-Tamil separatist using Christian evangelical forces to create various issues with the ultimate aim of ‘breaking India,’ the media has alleged. Further, the Jaffna-based Sri Lankan Tamil political party, Tamil National People’s Front (TNPF), which is known to tout the extremist Tamil line in the island’s politics, has called for a public protest against the slaughter of “Tamils” in Thoothukudi, thus turning the police firing on an environment issue into a Tamil “ethnic” issue, opening the door to undesirable developments for both India and Sri Lanka. In the nine years since the end of Eelam War IV in May 2009, Tamil separatist groups in Tamil Nadu had gradually changed their strategy from highlighting alleged “war crimes” in Sri Lanka to environmental issues in Tamil Nadu. Environmental issues could help plant a fear of mass annihilation among the population which could then be used to whip up feelings against the Indian State. The ambivalent attitude of the traditional political parties toward environmental issues m because they are more committed to fostering development and generating employment for their followers, helps the separatists. Such an attitude can help steer the population towards accepting anti-systemic and separatist groups like the Maoists in Central India and Tamil nationalist groups in Tamil Nadu. Separatists are using environmental concerns to prevent the industrial development of Tamil Nadu in order to create unemployment and social distress which they can then employ to whip up separatist sentiments. The biggest and longest agitation against development projects had been the one against the Koodankulam nuclear power plant. According to Arjun Sampath of the “Hindu Makkal Katchi”, external influences are creating movements against economic development projects in Tamil Nadu such as the International Container Tran-shipment Terminal at Thoothukudi port; the Outer Harbour Development works at the port; and the Oil and Natural Gas Commission’s project in Kathiramangalam. The separatists had used the social media to warn those who were hesitant to participate in the mass protest planned in Thoothukudi for 24 May. They were told that they would be branded “anti-Tamil” if they did not turn up or close shop on that day. Sampath called for a “serious probe” into the sinister dimensions of the Thoothukudi agitation. In an editorial The Hindu pointed out that it was intriguing as to why the protesters wanted a big showdown on 24 May, when the plant was shut for want of a license to continue to operate it. The leaders’ insistence on an agitation gives rise to a suspicion that the agitators had another parallel agenda, the paper said. However, Sterlite’s performance on the pollution front has not been of sterling quality. One of the largest copper plants in India, the Thoothukudi plant caught the country’s attention when the local population, apparently spontaneously, turned against the company soon after it started production. Locals alleged that it was causing severe pollution in the surrounding areas, making them uninhabitable. According to the New Indian Express the Thoothukudi region experienced more cases of respiratory diseases in comparison with other areas of Tamil Nadu. The paper gave examples of the presence of rusty-red water in taps due to an increased iron content in the groundwater. There were allegations about the impact of arsenic- laced waste water. Hazardous waste from the factory had caused some problems for women, especially, it was said. The unrest resulted in the Tamil Nadu Pollution Control Board (TNPCB) filing an affidavit against the plant. In 2017, the TNPCB had found the plant violating six parameters of Air (Prevention and Control of) Pollution Act, 1981 and 11 parameters of the Water (Prevention and Control of) Pollution Act, 1974 (amended in 1988). The TNPCB issued an order turning down Sterlite’s application to renew its consent to operate after the expiry of the original license. But after a routine maintenance shut down, the plant had allegedly started re-production without the permission of the TNPCB and was even planning to double its capacity with connivance of the Tamil Nadu government. This infuriated the local population and an agitation was started in March this year. Earlier the Indian Supreme Court had slapped a fine of INR 100 crore or $ 14.6 million. Recently, there had been a fresh injunction from the Madras High Court against a proposed capacity expansion plan. In its defence, Sterlite has said that it had observed all the anti-pollution safeguards. D. Dhanavel, head of the Safety-Health-Environment department at the plant, said that the plant had maintained a very low level of emission at 0.3 kg per tonne of copper smelting when the TNPCB had set the maximum pollution level at 1.0 kg per tonne of smelting. He dismissed the claim that sulphur dioxide was being released into the atmosphere saying that the factory is using all the sulphur to produce sulphuric acid. Dhanavel also pointed out that Vedanta group had won the Sword of Honour from the British Safety Council. Although the TNPCB had taken action, it had not been able to control Sterlite which, despite denials, has not come out clean. Unless the corporate sector is kept under constant watch and punished for transgressions in time, popular agitations cannot be avoided and these could well be hijacked by anti-national elements.